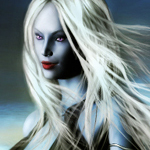 Physical Description Xana has pale blue skin and straight white hair that reaches a little past her shoulders. Her overall appearance is tall and curvy. She also has a bright, wide smile that has been called "charming" and "cheeky" depending upon the situation that she uses that quite a lot. She has limited telepathic/empathic bond with her husband, Jake Crichton that they can control (somewhat -it's influenced by time/space/emotion). With all others she has a strictly empathic bond that she uses to absorb emotions (mostly love and hate). She has 2 tattoos – the symbol of her house on her left breast (one heart on top of the other) and a small black tattoo on her left hand, courtesy of the Dominion from when they granted her asylum. She’s fluent in Federation Standard, Italian, and Bolian and can say a handful of phrases in other languages but not enough to be fluent, and usually those phrases involve food or cursing. Long dark blonde hair, blue skin, hazel eyes, can be overly dramatic, easily mixes being a tomboy and feminine, has the Bolian tattoo of her mother's house on her left shoulder. General Overview Xana is a very emotional person—she's become better though at covering this. She is a very generous and caring person--once she trusts and likes someone, she does so fully and without reserve. Additionally, she's quite charming and generally enjoys having a good time. There is a streak of stubbornness and a bit of a temper, and she’s not one to suffer fools and will happily tell you so. She's also active in the Bolian religion, and holds the title “Avatar” for the Goddess Serendipity (Goddess of Love) and the God Design (God of Pain). It's something she takes seriously but she's very respectful of everyone's beliefs. Ambitions To be a good mother, wife and serve the Federation. Personal History Xana was born on 2392, seven minutes before her twin Corina. At her birth, and until Corina's death on 2404, her hair was blonde. However, shortly after the shock of losing her twin in a hiking accident in the Alps on EARTH, Xana's hair turned white. At first unofficially, and then later by legal decree, Xana and her grandmothers raised Horatio and Iphie as her parents were too emotionally distraught with the death of a child and the collapse of their marriage to do so, essentially abandoning the children in the process. that they started too early in the morning and she preferred to sleep in when she could. In spite of all this, Xana performed her duty well enough to graduate first in her ACT class. During her brief time at USS AVALON, she showed talent in the Security field, which helped with her next assignment to GATEWAY STATION as Chief of Station Security. In between assignments, Xana met up with her sister Iphie and brought her sister with her to her next assignment, as their grandmothers, who had been taking care of Iphie, were in an accident. After her first mission with the GATEWAY crew, Xana lost her memory. After experimental neurosurgery back on the station, Xana recovered her memories, including being tortured, raped (first mentally and then physically) by the Taton.Also during that mission with the GATEWAY, Xana developed a telepathic link with the Counselor, Sally Kastra, during an Astral Projection as a way of dealing with the “reawakening” of her dormant paracortex. Once the link was severed after Sally left the station, Xana developed her own (limited) empathic abilities. her own personal craft. She used the SOLSTICE to race in the Catuallan races, where she tied for 2nd place. During that race, she met up with her ex-finace, Lt. Donatello Rochelli, resolved that relationship so that they are good friends now. Meanwhile her time on the GATEWAY proved to be interesting and her work in Security and then onto Operations provided her with a solid background and allowed her to move up the Starfleet ladder. After facing off against the Taton, she faced the Orion Syndicate where one its leaders, Momile, committed suicide in the brig of the USS GRIFFIN. and Andorans who had petitioned to have the GATEWAY removed. far she’s met a telepathic race called the Asazi and a quasi-Federation group called ISC. After that the ship met up with magical group called Ilumnans, who had dealings with the 8472s. After that Xana went on a paid vacation from SFI on a pleasure cruiser so that they could try and track down Metron’s Hammer, and along the way met up with notorious criminal, Zane Rixx. Then the PROPHECY, along with the GATEWAY crew, chased Locusta after they stole the PROPHECY and had Iphie (along with her friends) held hostage. Several things happened after the Locusta mission. First, Iphie became emancipated and enrolled in culinary school. Then in a move that then even stunned her, Xana accepted AJ O’Malley’s proposal of marriage after only seeing him for a short but intense time. However shortly later on the engagement ended with Xana unwilling to compromise on getting married and AJ unwilling to be a married Intel Agent. After her classified assignment Xana was promoted to Commanding Officer of the GATEWAY STATION-1 as it made the transition to GATEWAY STATION - 2. Although she was thrilled at the thought of being CO of her old home, she was upset at learning of the Calnarian battle and what it had done to the station. Nonetheless, she came to the station (bringing 3 flag officers and the media with her) to throw a press conference establishing her as CO (while passing out homemade cookies). While not exactly the same as from the first time she stepped on the station, she was still in many ways the same warm, open-hearted, chatty, romantic woman she always was. She started out her tenure as CO by outlining her goals that the GATEWAY be as open to everyone in the galaxy as a model of civility in her speech “GATEWAY Lumens”. Her first mission on the GATEWAY STATION as CO involved a temporal anomaly that was the result of a half-Q/half Drayan dying on the station (the Q/Drayan could control everything except her own mortality). After that, Xana took her crew to investigate the illegal activities of the USS ACHERON, lead by one Captain Sophie Lovelace. When the crew discovered that the ACHERON was capturing and torturing Tosk, in the name of science (in turn funded/supported by the Essentialists lead by Admiral H. Ordway). Once it was discovered that the GATEWAY crew knew what was going, all but one of the crew (who defected to the other side) the crew was arrested and found guilty of “crimes against the Federation” (the trial was fixed) and sentenced to life in SING SING II on DEIMOS (one of MARS' moons). Jaxsper Lawrence arranged a breakout of SING SING II (making it look like he killed her) and brought her to the Dominion who gave her asylum. Once they were able to clear her name, Jaxsper brought her to the SUTTNER who was helping the EIDOLON face off against the Dominion and Borg. After that the crews were able to negotiate a tense peace. After that incident Xana along with some others formed a group called the Illuminati. The Illuminati's purpose is simple – to use whatever they can within their disposal to stop all Essentialist, and neo-Essentialist, activities. After she gave another policy speech, “Pax Federatio”, which outlined a modern version of “speak softly but carry a big stick” the EIDOLON out on a mission chasing down the Orion Syndicate and was eventually destroyed in the line of fire. Xana accepted all surviving crew members, including her lover (Gene McInnis) into the GATEWAY's staff since she felt responsible for the ship's demise. The Q visited Gene and Xana (who by that time had eloped due to her pregnancy) and told them as retribution for the Q/Drayan dying on the GATEWAY, they were going to take their baby, Dahlia, who Xana was still pregnant with. Eventually a truce was negotiated and it was decided that when the child was 12, the couple would have to share custody with the Q and when the child turned 18 they she could decide for herself. So far future versions of Dahlia have appeared twice to Xana. The first time Dahlia was in her mid-twenties and she appeared to Gene and Xana, with the Q, during the time they learned about this arrangement they'd have to have with the Q. Unbeknown to her parents, Dahlia seems to have obtained some of the Q powers. Ultimately after a distinguished, if very bumpy, career Bonviva retired from Starfleet and became the Ambassador from EARTH to Starfleet. Although she served well, she still managed to get on the wrong side of her political party’s platform, so she accepted a lateral move as Ambassador from the Federation on the GATEWAY-2, a station she once commanded but has always called home. In 2422 several events happened, beginning with the closing of the Wormhole, that affected Xana very deeply. The first was that she was granted temporary custody of Peyton and Michael “Mikey” Svenson since their father (Commodore Troy Svenson) was stuck in the Alpha Quadrant when the wormhole collapsed. The second event to radically affect Xana was the GATEWAY’s succession from the Federation which lead to her position as Ambassador being null and void. Upon succession she agreed to run for office (Governor of the GATEWAY). However the elections were suspended due to the Dominion War with GS-2. During the war Xana agreed to go over to the Dominion battleship to establish the rules of warfare and to buy the GATEWAY time during the fight. However during this time she was imprisoned the Dominion sent over a Changeling that looked and sounded like her. Her husband, Gene McInnis, sacrificed his life in killing the Changeling that looked like his wife. The second time an older-out of timeline-Dahlia appeared (again with a representative of the Q Continuum), she was 12, and sat in the back of Gene McInnis' funeral service on BAJOR. The events after the Wormhole closing lead to the third event that’s radically affected Xana – the death of the love of her life and reentry in Starfleet, as the CO of the USS MCINNIS, to avenge her husband. However, less than a year into her tenure she realized it was a mistake and quit. Looking for a job, and a break from politics and military life, she invested her savings into opening up her own restaurant on the GS-2, “The Angel's Angst”. However, not all of her savings went into “The Angel's Angst” -- some of it continued to go into anti-Essentialist (or Illuminati) activities, this time under the name of a holding company she started “Quis Tunc”. Once back on the GATEWAY STATION, Xana agreed to go into a Durali Abyss to help guide Jake Crichton back. While there she first found her late husband; after a tender goodbye they formerly married couple agreed to let each other go. After that Xana found Jake, and woke him up with a kiss, and eventually they made it out of the Abyss but not before freeing themselves (and Dahlia) from Thoralas, a Durali soul intent on taking over Jake. Despite her growing feelings for the engineer, she didn't act on them and when the CHANTICO (the GATEWAY's support craft) blew up with no apparent survivors she regretted it. Beginning on the GATEAY and then while on the APPARITION (Jax Lawrence's ship where she was helping Jax with the recovery mission) Xana thought she was going mad as she was experiencing visions of Jake and feeling his emotions at times. Eventually after the CHANTICO survivors were found, Jake and Xana reunited and confessed their love for each other. Today they love each other very much, and their psychic bond is limited to the occasional vision of each other and feeling what the other feels. For awhile Xana was happy running the “Angel's Angst” but with the Second Dominion War at the GATEWAY's doorstep, she returned to diplomacy to help broker a deal with the Dominion. Although unpopular with Admiral Ordway (one of the lead Essentialist forces behind the Second Dominion War) Xana was deeply proud of the role she and others played. After the war, Xana stopped on BAJOR to have an oxderlinjk ceremony with her close friend, Daisy Bonviva (nee Davidson) so they could bond their families. Immediately after the oxderlinjk, Daisy surprised Xana by having arranging a wedding for Xana and Jake Crichton. After the weddings Xana and Jake settled on EARTH while trying to balance their work and home lives. Not long after the wedding, they were delighted to discover Xana was pregnant. Unfortunately not long after Benito was born, Jake accepted a position on the USS SHERWOOD and Xana stayed on EARTH with the kids. While on EARTH Xana worked her way through various political positions until she was tapped to become Secretary to Starfleet. She stayed in that position for a few years until her children were kidnapped as retribution for her policies. Once they were safely returned, Xana stepped down and along with the entire family followed Jake into space on the PHOENIX. That lasted until the siege of BOLARUS IX, when she felt compelled to help. Leaving her family, Xana went to BOLARUS IX she took on the position of Director of BOLARUS Office of Protection to fight in the war. Once the siege was over, she was reunited with her family. Happiness was short-lived as she separated from Jake Crichton, thereby upsetting their young children. This time Xana took custody of the children and went to VULCAN to work on the campaign for Hussein Karimi and his campaign for the Federation Assembly and then the Council.